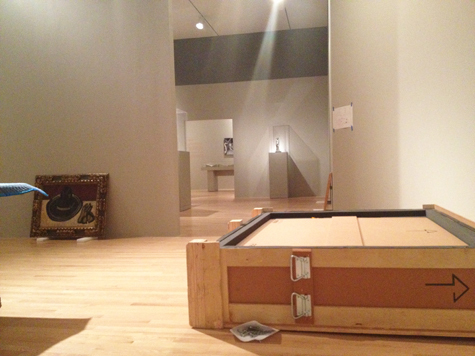 The year 2013 has been an exciting one at the DMA. We’ve welcomed more than 540,000 visitors, launched new programs, and hosted 11 exhibitions. Below are a few of the Uncrated team’s favorite highlights from the past year. We returned to free general admission on January 21 and have loved every minute of opening our doors for free to the North Texas community. In January we launched DMA Friends, the first free museum membership program, and our new friends have been earning points on their visits and redeeming them for unique rewards for almost 12 months! Speaking of unique rewards, we hosted our first DMA Overnight in November. Ten DMA Friends redeemed 100,000 points to spend the night at the Museum with a guest while exploring the galleries after hours, participating in new DMA games and sleeping under the watchful eyes of Tlaloc. Come by and see new works of art and activities for all ages in the front gallery of the Center for Creative Connections on Level 1. 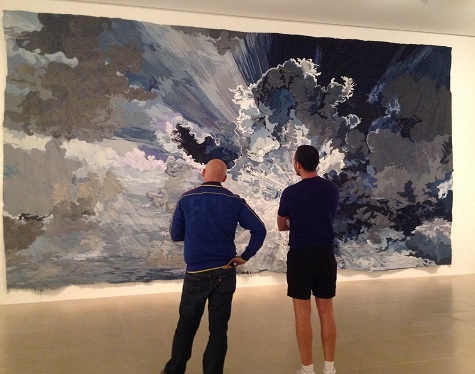 The DMA co-organized exhibition Jim Hodges: Give More Than You Take (on view through January 12!) is full of beautiful and interesting works of art, but we had the privilege of being the first venue to ever show his denim work Untitled (one day it all comes true). It was amazing getting to witness Jim Hodges viewing his completed work on display for the first time. This was the year of anniversaries here at the DMA, including the 110th birthday of the DMA, the 80th anniversary of the Dallas Free Public Art Gallery becoming the Dallas Museum of Fine Arts, the 50th anniversary of the merger of the DMFA and DMCA, the 30th anniversary of the DMA Sculpture Garden opening, the 20th anniversary of the Hamon Building opening (which includes Level 4 and the Atrium), Arturo’s 10th birthday, and the 5th anniversary of C3. We had a year of amazing exhibitions, from a celebration of President Kennedy in Hotel Texas: An Art Exhibition for the President and Mrs. John F. Kennedy to the colorful world of Chagall’s sculptures, drawings and costumes in Chagall:Beyond Color, from the famous Discus Thrower from the British Museum in The Body Beautiful in Ancient Greece to welcoming the local art community in DallasSITES: Available Space. This fall we launched our first-ever bilingual (Spanish and English) guide for visitors, written by members of the Dallas community through a partnership program with AVANCE-Dallas and Make Art With Purpose. Pick one up at the Visitor Services Desk on your next visit. 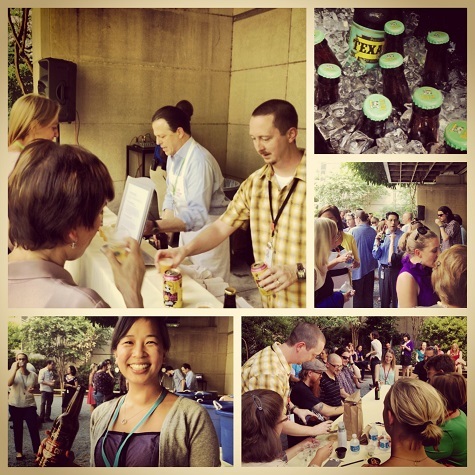 This summer we had a Texas beer social for Museum staff and sampled brews that come from the Lone Star State. Uncrated team member Melissa Nelson Gonzales out- sipped the competition and won the beer tasting contest! 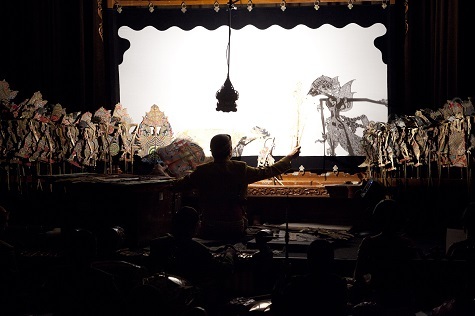 In June we celebrated the publication of our catalogue Eyes of the Ancestors: The Arts of Island Southeast Asia at the Dallas Museum of Art and welcomed special guest Dhalang Purbo Asmoro, who hosted a public gamelan and wayang performance with musicians from Java, Bali and New York. This month, the book was named the winner of the 2013 International Tribal Art Book Prize. 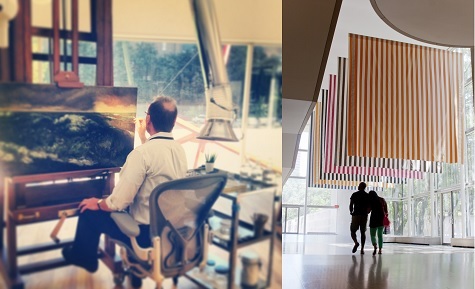 We launched a new program this year, the Pop-Up Art Spot, taking C3 into the galleries and inviting visitors to enjoy a creative break while exploring the Museum. Over 12,000 visitors of all ages have participated in drawing, writing and other creative activities! 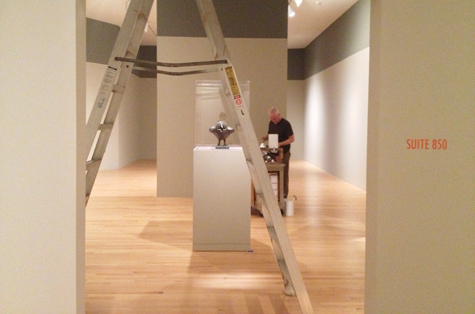 In 2013 a portion of the south end of the building was under renovation for the new DMA Paintings Conservation Studio (watch the transition here). Visitors can see into the DMA’s Conservation Studio and explore the conservation process in the adjacent gallery for free during Museum hours. A recent conservation project, Daniel Buren’s Sanction of the Museum, hangs in the Concourse and leads the way to the studio. 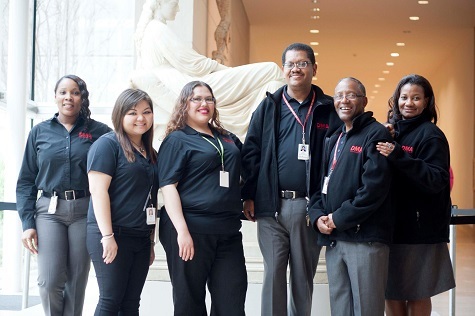 Our Visitor Services Team, which greets every guest of the DMA when they walk through our doors or visit the galleries, also got a makeover. You may have noticed their friendly smiles and new outfits during your visits this year. Thank you for helping us make 2013 a great year. We wish you a very happy new year! Kimberly Daniell is the manager of communications and public affairs at the DMA. We are in the final two weeks of the DMA-organized exhibition Hotel Texas: An Art Exhibition for the President and Mrs. John F. Kennedy, but there is still time for you to visit this free exhibition and learn more from historians. This Thursday at 7:30 p.m., Dr. David Lubin, author of Shooting Kennedy: JFK and the Culture of Images and Charlotte C. Weber Professor of Art at Wake Forest University, will examine iconic photos of the Kennedys’ visit to Texas and discuss his book. Below, learn more about the history of the installation in Suite 850 from Hotel Texas catalogue contributor Scott Barker. Kimberly Daniell is the public relations manager at the DMA, and Ted Forbes is the interactive media developer at the DMA. 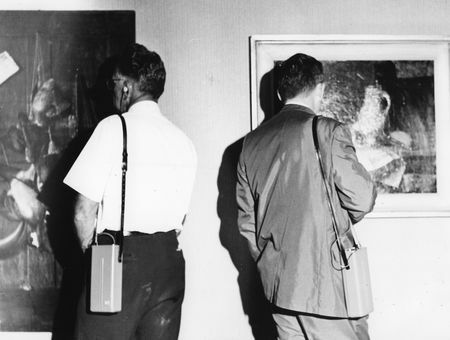 Audio tours have been part of the Museum world for a while, but now you no longer need a shoulder strap when exploring the DMA’s collection. 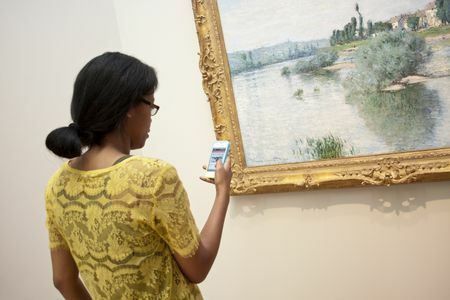 Visitors to the DMA can use their web-enabled devices to access information about the collection, including video interviews, images, geographical information, and responses from the community through the DMA smARTphone tours. Some special exhibitions even have a free smARTphone tour. Right now, discover oral histories tied to Hotel Texas: An Art Exhibition for the President and Mrs. John F. Kennedy (on view through September 15, 2013), and this October you can learn more about the Jim Hodges: Give More Than You Take exhibition from artist Jim Hodges and co-organizing curator Jeffrey Grove, senior curator of special projects & research at the Dallas Museum of Art. Hillary Bober is the Digital Archivist at the Dallas Museum of Art. Visit Zajac’s Small Bound Goat through September 15 in Hotel Texas and see it for free; the exhibition is included in free general admission to the Museum. Uncrated chatted with Alan, founder and president of Documentary Arts and the installation’s producer, to pick his brain about his creative process and vision for this work. 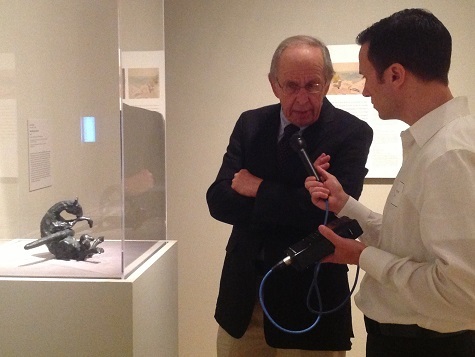 Join us at the DMA during our July Late Night on Friday, July 19, at 7:00 p.m. to hear Alan discuss his installation. When did you begin researching JFK memorial songs? It was 1975, so nearly forty years ago. I had heard about the Mexican-American corridos and started gathering the records when I could find them. I had written a lot about blues and jazz, and this was part of it. What was the impetus for this project? The piece was originally commissioned by the International Center of Photography. Brian Wallis, Chief Curator at the ICP, has organized a show of photographs, JFK November 22, 1963: A Bystander’s View of History, that look at the assassination from the viewpoint of bystanders. All of the singers are in a way personalizing their relationship with President Kennedy, either as friend or savior, champion of the downtrodden, the advocate for the forgotten or the disenfranchised. The songs juxtapose that sense of feeling a personal relationship with the president and the great sense of loss, the tragedy of his killing. 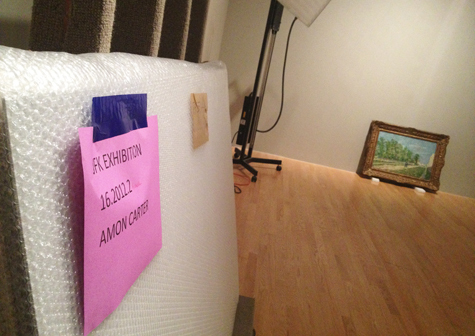 You’ve referred to this installation as an “experience.” How do you envision DMA visitors experiencing this installation? All of the songs are topical. All were released on record. Most were written within days of the assassination. The installation is an audio loop, and the anchor, or punctuation point, is an eyewitness account released on an LP within days of the assassination. A man just saw the assassination, and someone put a microphone in his face and asked him what he saw. He was panicked, on the verge of crying. He had his five year old standing next to him. He was ready to pounce on top of him to protect him because he thought there was a maniac on the loose. That sets a certain stage for the rest of the piece, which is startling and haunting. But, there’s an aspect of the songs that has you smiling. It throws you back in time and place. Much of what the piece is about is perception and memory. 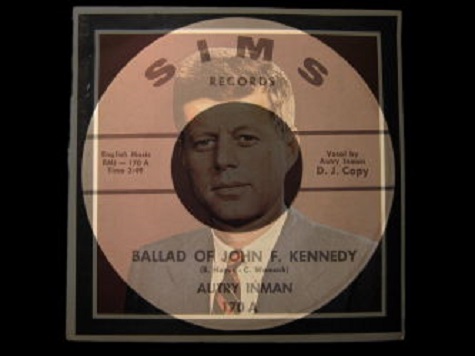 What was your creative process behind the image of JFK that continuously dissolves into images of record labels? It has a meditative kind of effect, seeing that image reappearing. In some senses, I intended it to be reassuring, comforting, but also, it’s a memorial. It’s like looking at a tombstone. Those slow dissolves into the record labels that go in and out of JFK’s face are haunting, I think because of the idea that he was shot. It’s a complex, emotive kind of experience. Keep our minds on Jesus for he’s a President, too. It identifies Kennedy in that role, as a great savior who was martyred. Why do you think Kennedy was memorialized through such diverse musical genres? Corridos extol the virtues of the president who excited our passion to bring equality to all. The blues singers could identify with the sadness everyone was feeling. Country songs are often about mortality. It fit neatly into traditional music forms, where the way people were feeling could be expressed. * “Listening Hard” runs in the C3 Theater at designated times during Museum hours and is included in free general admission. Andrea Vargas Severin is the Interpretation Specialist at the DMA. This weekend, the DMA-organized exhibition Hotel Texas: An Art Exhibition for the President and Mrs. John F. Kennedy opens. 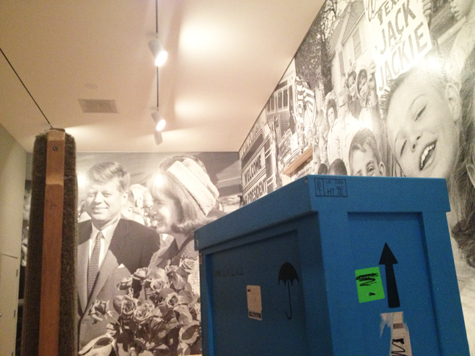 It brings together works of art that were on view in President Kennedy’s Fort Worth hotel suite in 1963. This is the first time the works have been reunited in fifty years. 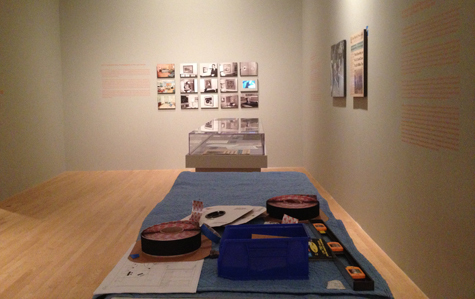 We’ve been installing in the galleries this past week, prior to the Sunday opening of this free exhibition.